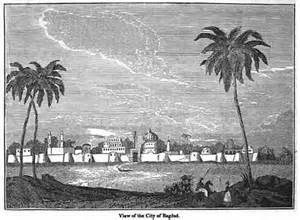 Baghdad - Al-Mansur, the second caliph of the Abbasids, wanted to build a new capital for the new caliphate. So in 762, he commissioned the construction of the city of Baghdad. The Umayyad capital had been in Damascus (and later Harran), but al-Mansur moved East, near the old Sāssānid capital of Ctesiphon. There had already been a town there and it was named Baghdad, but al-Mansur wanted a city. A city of magnificence. Upon choosing the site, he reportedly said, "This is indeed the city that I am to found, where I am to live, and my descendants will reign afterward." Although it was to be a new city for a new empire, its location had been a region of power dating back to the very beginning of History. It was the land of Mesopotamia, where civilization's first city-states arose. The aforementioned Ctesiphon was only 19 miles (30 km) to the southeast; and the ruins of the ancient city of Babylon, the capital of the two Babylonian Empires (Old and New) were only 56 miles (90 km) to the south. The new Baghdad was laid out in a circular pattern and for centuries was referred to as the "Round City". As the Abbasid Caliphate rose in power, so too did Baghdad. It quickly became a religious and cultural center for the entire Islamic world. Ctesiphon, which remained after the fall of the Sāssānid Empire quickly dwindled and eventually was abandoned. The famed House of Wisdom was founded by al-Mansur's grandson, al-Rashid. Baghdad stood as the capital of the Abbasid Caliphate and was the most important city in Medieval Islam until its fall in 1258 by the Mongol Empire. After that it became almost deserted until the region was conquered by the Ottoman Empire three centuries later, and the city was revived.